One of the highlights of my trip overseas from North Carolina to attend Star Wars Celebration 2016 was the incredible opportunity to tour Skellig Michael, where the final scene of Star Wars: The Force Awakens was filmed, the week before. 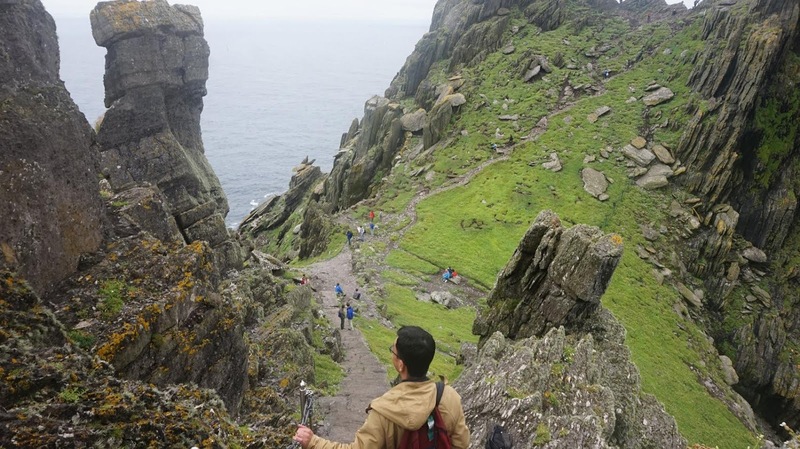 I had saved up three weeks of vacation time to justify the cost of traveling abroad, and formulated an itinerary to work my way up from Spain to Ireland in the hopes of stepping foot on the island before the convention and my eventual return home. 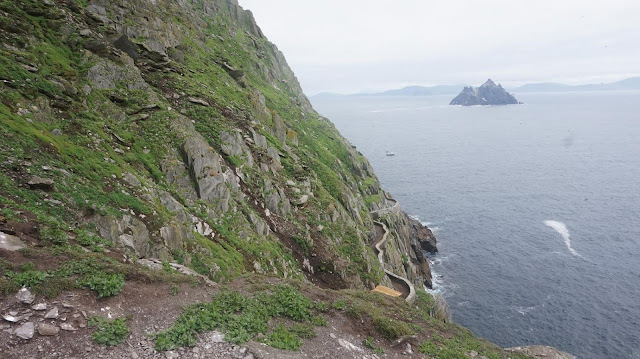 To be safe, I booked this tour with Casey’s Skellig Island Tours in mid-March, but there was no guarantee that weather conditions would cooperate. I had one day for this plan to work because that evening I’d have to travel to Dublin before my week-long Paddywagon tour started the following morning. Would the Force be with me? Thankfully, the weather conditions were great and I enjoyed a 45 min. boat ride out to the island. I was absolutely delighted the closer and closer we got to Ach-To Skellig Michael. I befriended a Canadian named Rich who had originally made plans in 2015 to visit the island because it’s a UNESCO Heritage Site. However, he was even more excited after seeing The Force Awakens and wanted to photograph himself walking among the Beehive huts just as Rey did. One of his first questions to me as we journeyed to Skellig was “Did you bring your lightsaber?” My Vader hoodie must have given it away! 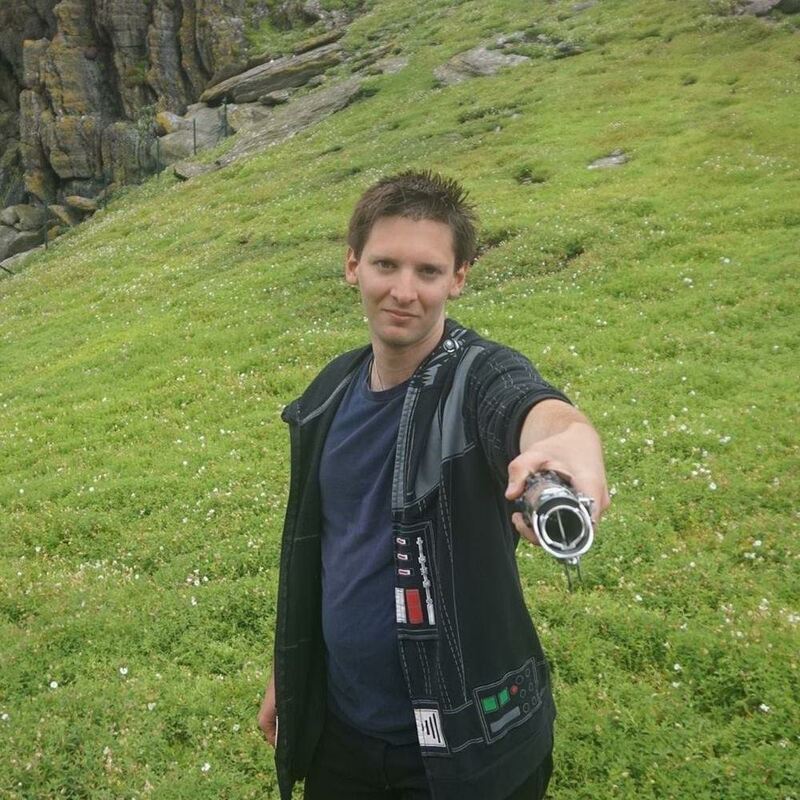 That’s the best part of the Star Wars experience… making friends along the way from all across the globe. 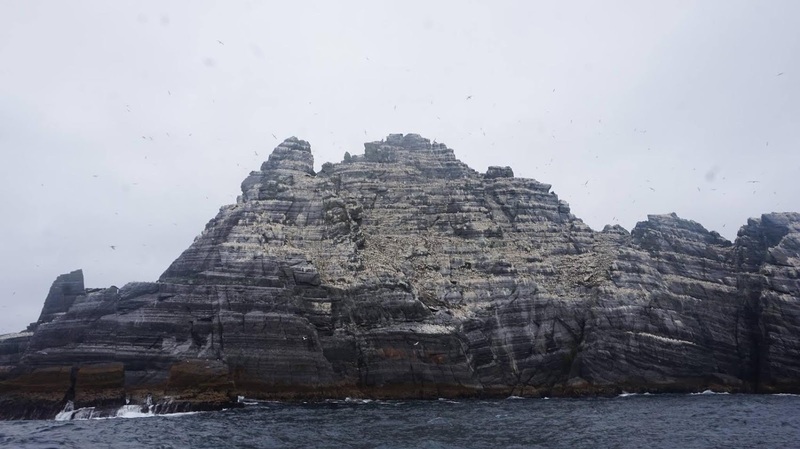 The island itself is so incredibly beautiful, with such a great number of puffins and birdlife that aren’t afraid of being close to people. 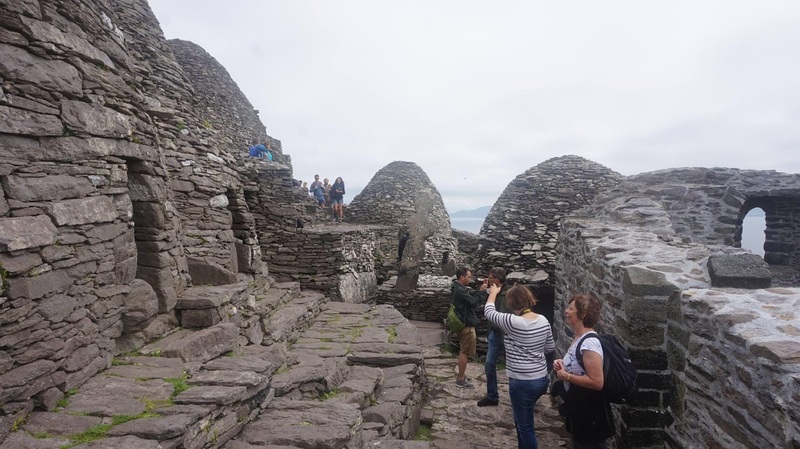 “The Jedi Steps” echoed in my head as I ascended the steps (though I wasn’t completely in tune with the Force due to the amount of other tourists milling around). The pictures really don’t do it justice; it might just be the coolest place I’ve ever visited. Upon reaching the monastery, the day’s visitors learned about its rich history, and Rich and I reenacted the scene from the film as best we could (with a few added extras). 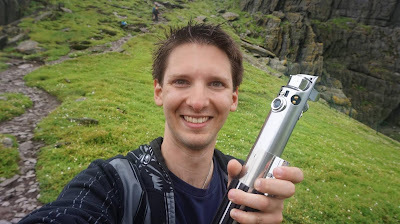 On the way down, I was able to take a few photos with a certain “elegant weapon from a more civilized age” you may have seen before. I’m not sure how close we were to the final shot of the film, but we were both happy with the effort made to find it. 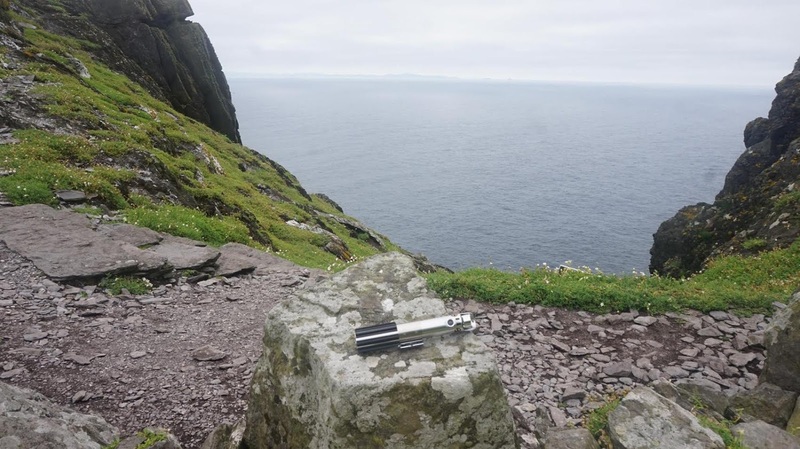 I HIGHLY recommend all Star Wars fans make the extra effort to visit the Skelligs. Many locals--including my tour guide--hadn’t been yet, even if they know its history. Brendan Casey, my boat captain who’s been doing the tour for 25 years(!! ), was able to transport me from the Sive Hostel in Cahersiveen to the Portmagee docks the morning of the voyage. However, booking in advance is a priority, due to the high number of visitors. I hope this read and images are enjoyable and encouraging, and feel free to let me know if you have any questions! 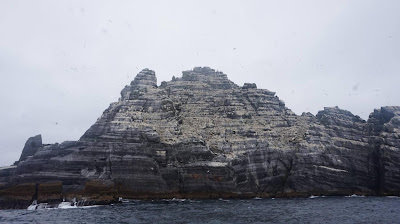 How, I am going to Killarney in October and even I can get only Eco Tour in the Octobor 15, I wanna see the islands even like this and next summer even with landing. I can I get from Cahersiveen to Portmagee - because there is no bus line or anything and if the way is with Brendan Casey how / where can I ask him in order to take me there and what does it cost?